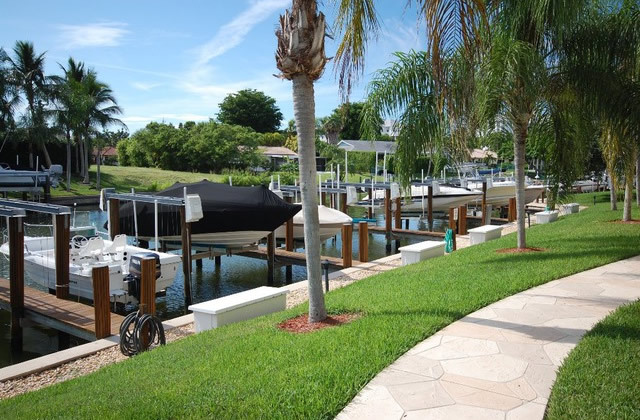 Developed in 1997, Eagle’s Retreat of Marco Island is a waterfront condo situated on the northern tip of the island. It is located on 1136 Bald Eagle Drive and has 16 charming units on 3 floors. Each pet-friendly unit offers 700 square feet in living space with a private balcony or patio. Eagle’s Retreat is a perfect property for the retiree or for a couple’s peaceful romantic getaway. Guest amenities include a heated pool, lifted boat dock, covered parking, and BBQ area. The property offers a quiet and intimate sense of community. The property grounds are engulfed with beautiful, mature palm trees surrounded by colorful, vibrant flowers, which delight the senses. Eagle’s Retreat condos are only a short thirty-minute drive to Naples or The Everglades. Attractions on the island include water-sport rentals, fishing charters, boat rentals, golf, hiking, history and art museums, shopping, and numerous, excellent restaurants, and of course, those wonderful, lazy days on beautiful white-sand beaches. Eagles Retreat has a maintenance fee of $400. It includes master insurance, cable TV, lawn maintenance, landscaping, manager, pest control, trash removal and water & sewer. In the world of maintenance fees, this is pretty low for a waterfront condo, especially given the low number of units in the development. Eagles Retreat is pet-friendly. They allow residents to have one pet, up to 25 pounds. They have a minimum rental period of 30 days. This is preferred by owners that will be using the unit themselves primarily. Investors buying with an eye on rental income might go for Angler's Cove or Riverside on this side of the island. We could not dig up any floor plans for Eagles Retreat. If you have questions about layout or need measurements, give us a call and we'll run them down for you. Click here to see all Eagles Retreat floor plans.